Der Artikel Renaissance im Norden - Musik an den Höfen der Weserrenaissance wurde in den Warenkorb gelegt. 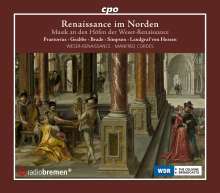 Zum 25-jährigen Jubiläum des Ensembles WESER-RENAISSANCE Renaissance im Norden auf 4 CDs zum Sonderpreis! Das Ensemble WESER-RENAISSANCE Bremen und sein Leiter Manfred Cordes feiern dieses Jahr ihr 25-jähriges Jubiläum, und wir sind stolz und froh, mehr als 25 CDs zusammen auf cpo veröffentlicht zu haben. Das Ergebnis ist nicht nur historisch hochinteressant, sondern auch immer musikalisch packend. 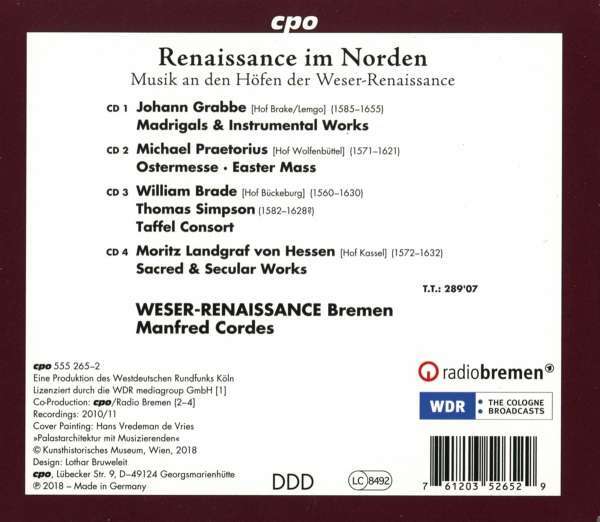 Wir gratulieren und veröffentlichen passend eine 4-CD Box unter dem Titel „Renaissance im Norden“ mit Musik von verschiedenen Komponisten, die an den Höfen der WESER-RENAISSANCE gewirkt haben. Meisterwerke von prunkvoller Pracht aber auch ganz filigranen Momenten. WESER-RENAISSANCE’s Twenty-Fifth Anniversary The Renaissance in the North on Four CDs at a Special Price! This year the WESER-RENAISSANCE of Bremen and its conductor Manfred Cordes are celebrating their twenty-fifth anniversary, and we’re proud and happy to have released more than twenty-five CDs by this ensemble on cpo. The result is highly interesting historically as well as always fascinating musically. 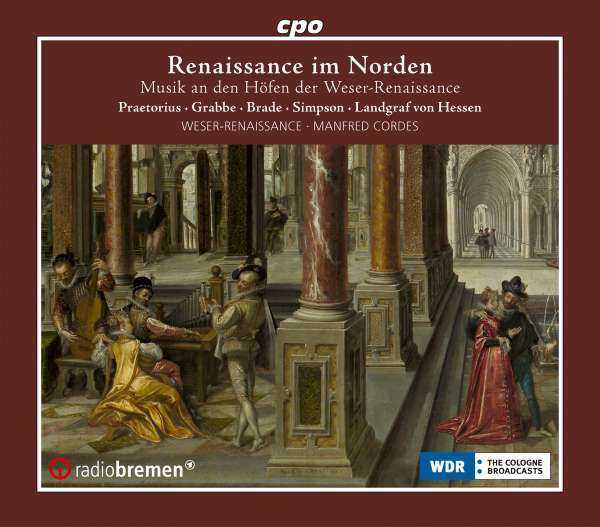 We extend our congratulations and in keeping with the occasion are releasing a box of four CDs entitled Renaissance im Norden (Renaissance in the North) and featuring music by various composers who were active at the courts of the WESER-RENAISSANCE and masterpieces offering magnificent splendor as well as very filigree moments.